Cahir Students, Leah Fitzgerald and Aoife Allen have made it through to the Junk kouture Regional finals in UL at limericks concert hall on the 9th of March. 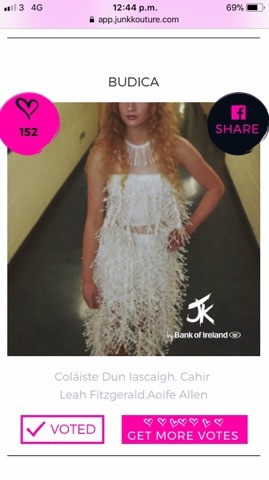 10% of votes are for their score in UL.This dress was made by Leah Fitzgerald and Aoife Allen. You can vote with this link https://app.junkkouture.com !! You can vote every 24 hours . The name of the dress is Budica and it is in the southern region.